The are so many things to be excited for when it's Back to School season! New adventures! Learning! No more summer camp! But one thing that many parents dread as September rolls around each year, packing school lunches. Planning dinners for your family can be hard enough, with managing everyone's schedules, preferences, maybe even food allergies. And then, to have to plan a totally separate lunch on top of that? My kitchen is not a 24-hour diner! It's no wonder why so many parents get stuck in a rut, relying on rotation of sandwiches, leftovers and snacks week after week. We look for inspiration wherever we can find it: Pinterest, other parents, TV. My tip, use your school cafeteria's lunch menu to be your muse. It may sound a little strange, but planning meals based on your school’s menu may help your child try more foods, make more friends, and give you a thumbs up on their lunch! There are lots of reasons what parents decide to pack a lunch for their kids rather than having them eat in the school cafeteria. For some families, the cost of purchasing school meals each day may be more expensive than bringing meals from home. Many families also are concerned about the quality of the food being served, or maybe they prefer to eat mostly organic foods (which is not what most schools are able to serve). Families who have a child with food allergies may not feel comfortable eating school food due to the risk of cross-contact. And some families (like me!) just like providing their kids with meals from home. When my daughter is old enough, she's sure to get plenty of sappy mom notes in her lunch box. I'm not trying to get you to change your mind about buying lunch at school instead of sending it from home. 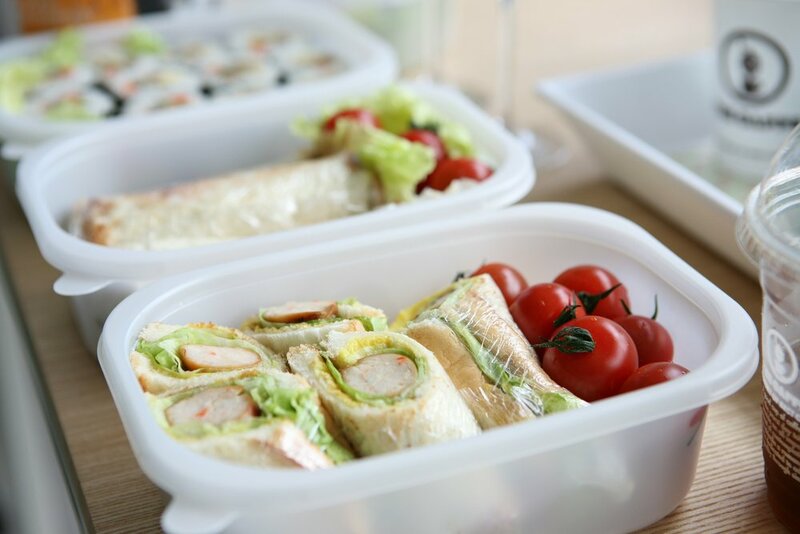 Rather, use your school's lunch menu to inspire you, to give you ideas on what to pack for your child in the coming week. Consider it one additional meal planning tool you have at your disposal. Schools that participate in the National School Lunch Program are required to meet certain nutrition guidelines when planning their meals. They have to serve a certain number of fruits, veggies, whole grains, etc. And, you might be surprised at what your school is serving. The school in my neighborhood, for example, has kale chips on its menu! It's already planned out for you! There are already people in your school and school district that plan the school's menu, so why not take advantage of their hard work! Many schools are now trying to incorporate more seasonal fruits & veggies, and create menus that are more appealing for students. At the end of the day, kids just want to fit in with their peers. They want to bond with other kids and develop strong and healthy relationships. Whenever I work with children with food allergies, I always encourage parents to serve everyone the same meal, or as close to the same meal as possible. With everyone eating the same food, no one feels left out or different. It's a great way for kids to feel included and to bond with others. This doesn't have to only apply for kids with food allergies. Any kid could benefit by eating similar food to other kids. Never underestimate the power of peer pressure! Your picky eater may just branch out if they're eating similar foods to the other kids at school. Many schools are now diversifying their menus and trying to reflect foods of other cultures. Instead of copying your school's menu day-for-day, use these tips to get inspiration when planning your meals. Show your child the menu for the week (or read it to them), and let them pick one or two meals that they'd like to recreate for their school lunch. By getting your kid's opinion, not only will it increase the chance that they'll actually eat the food you prepare, but it will make meal time more fun for them! Bonus points if you can enlist your child to help MAKE their own lunch! Instead of copying a whole meal, just choose one component, like the main, the veggie, or the salad bar. This works especially well if you are stuck in a veggie-rut or a fruit-rut instead of an overall lunch-rut. When I was a child, my absolute favorite day of the week at school was Pizza Day! Many schools incorporate theme days into their menu, whether they are for holidays, or just for fun. Look at your school's theme days to plan special meals for your child. Many larger schools or school districts publish separate menus for different dietary patterns, like vegetarian meals, halal, kosher, etc. In my opinion, these menus are way more inspirational than your standard lunch fare. For example, at my local elementary school, the vegetarian menu has meals like 'Roasted Chickpea Tagine' and 'Zucchini Parmesan'. Sign me up! What's the most interesting item on your school cafeteria menu? Let me know in the comments! What Makes White Asparagus White? Sep 6 Is Coconut a Part of Tree Nut Allergy? Keep up with the latest from Nutrition Hungry!